In a certain part of town, most of the buildings have to do with agri-industrial uses. And while they are not lovely in a traditional sense, they do catch the light in a certain way late in the afternoon. 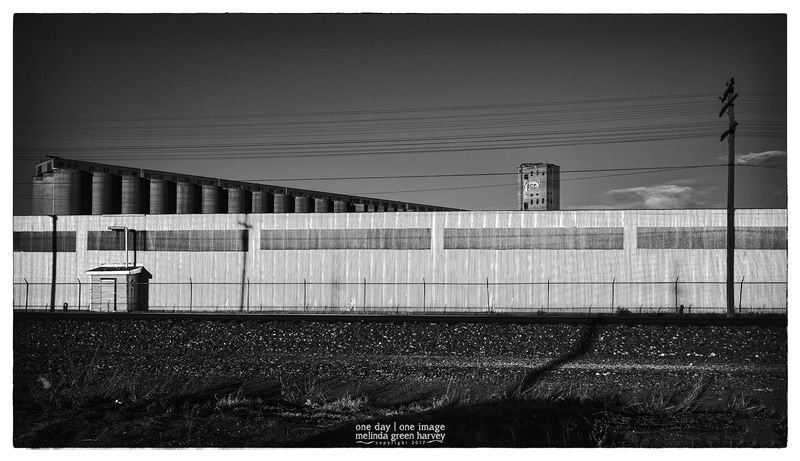 Posted on February 11, 2017, in Photography and tagged 365 photo project, black and white photography, industrial architecture, Leica, lubbock, lubbock texas, melinda green harvey, monochrome, one day one image, photo a day, photography, postaday, texas. Bookmark the permalink. 8 Comments. Your correct I can see. And it will be more and more unique and interesting as time goes on. You may be the only one who is documenting these structures in art photography. What a fabulous archive you are building, Melinda! There are a lot of buildings that I’ve photographed over the years that have disappeared, and I keep thinking I ought to do an “in memoriam” page on my blog. It took me kind of long time to realize that maybe some of my random wanderings could be historically significant; sometimes I forget to see the obvious stuff. It is exciting that that process is already underway. I think you and Mr E are both building archives of future historical significance. Both equally valid if the results are as good as yours. I’ve always appreciated the direct honesty of industrial buildings. Usually no, or very little, adornment. Just what’s needed to get the job done. Yes, I agree. After buildings that are falling down, industrial architecture is my favorite sort of architecture. To look at AND to photograph.